When last we met (last week’s column), I was in the kitchen of Skylight Inn in Ayden, watching Mike “Chopper” Parrot. He was using his weighty, custom-made cleavers to chop pound after pound of some of the most beautiful pork I’ve ever seen. Slow-cooked ‘til falling-apart tender, with crispy skin so golden it should be stored in Fort Knox like the precious substance it is. The man currently looking after this family concern, Sam Jones comes into the kitchen, and asks if I would like to visit his new restaurant, Sam Jones BBQ. He also wants to take me to the old family homestead, to see the pit on which his grandfather, Pete Jones, learned to put fire to pig. Our first stop is eight miles away, in Winterville, site of his new venue. Located in a newish commercial district, the new restaurant looks like a trim barn with a metal roof. 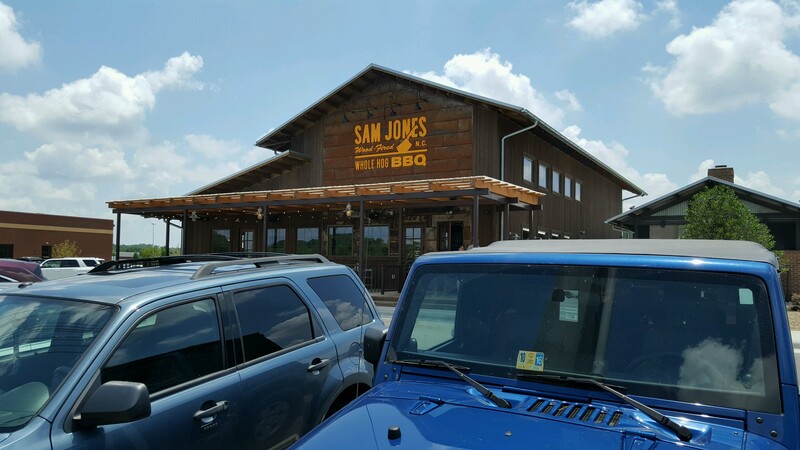 The expanded menu of Sam Jones BBQ is the motivation for the new eatery. Skylight has been a beloved tradition since 1947. You don’t put the Statue of Liberty in a sundress, you don’t get Harry Potter contacts, and changing the menu at Skylight just isn’t done. But the pig is still cooked slowly in a detached cookhouse. All the menu items are made from scratch. French Fries and potato chips both begin as whole potatoes. The macaroni and cheese start by making a roux, and dessert comes from the chef’s imagination, not a number in a food service catalog. 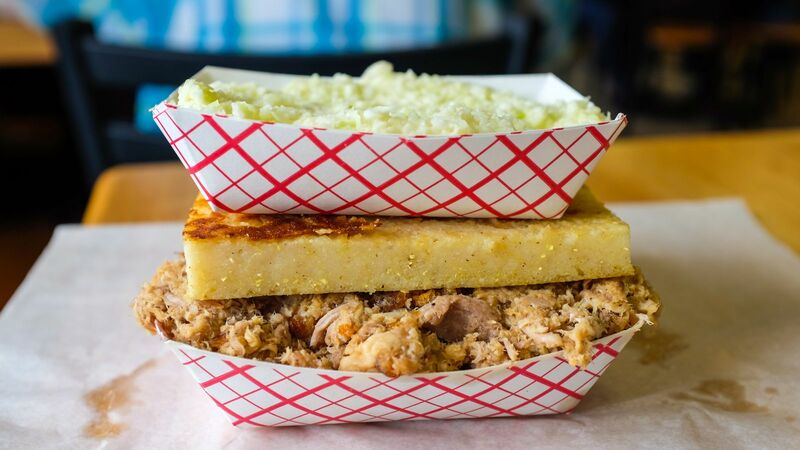 And, if you’re a stickler for tradition and can’t quite make it Ayden, they also serve the classic Skylight plate of barbecue, coleslaw and cornbread. About that cornbread… It’s not like anything I’ve ever eaten before. It’s definitely not cakey, sweet, normal cornbread. I’ve had corn sticks, that’s not what it is either. My problem is I descend from Yankees. If I’d had some Southern kin, it wouldn’t be unfamiliar. ‘Cause it’s cornpone. The outside is crispy, with almost a fried texture. But it’s the inside that’s the carnival for your taste buds. It’s creamy like a bowl of grits. The combination of flavors and textures are complex and compelling. Sam told me there are only four ingredients—and one is lard. But after some looking, I’ve found a recipe that doesn’t come from the Jones family but comes out as close as you’re going to get without a trip east (which I enthusiastically recommend). Brandon, the Rembrandt of cornpone. This recipe comes from a website called, BBQ-Brethren, and a guy that calls himself T-Man. But I changed his procedure because I watched Brandon Allen making pan after pan at Skylight. I finally stopped him for a second so we could share a piece. Brandon poured in a ladle of melted lard, then poured the batter over it. After it came out of the oven, he popped out the cornpone and recycled the lard. Pre-heat oven to 450. Melt lard in 9×14 pan. Mix dry ingredients, add water and mix. Take out pan, pour in batter, and bake for almost 1 hour, until deeply golden. Daniel, giving that pig one last dance. Actually, he’s preparing it for the pit. It was a very memorable day. I could write reams and reams about my adventures. The shame I refer to in the title? Leaving, I got turned around many, multiple times. It took me an hour to travel the first ten miles. And, no, I don’t need a GPS. But I am in the market for a live-in Sherpa… Thanks for your time.